Keep Your Paper Happy and Your Office Will Be Too! We’re growing and constantly upgrading so we can continue to provide the outstanding service that our valued clients deserve. 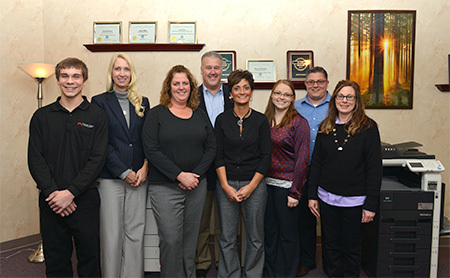 We’re ending 2013 with a number of changes to our valued Martin Group team! Ross Gruenwald has been promoted from technician to field service manager. Ross will head up our Service Department and manage our service technician team. Many of you already know Ross from working with him as a field service technician. Brian Willis is another technician who has recently been promoted. Brian’s new position is field service supervisor. In addition to his own responsibilities, Brian will assist Ross in his duties. Andrew Klabunde is a new training specialist. His duties will include delivery and set-up of new devices as well as client training. We greatly value our family of clients, many of whom have been with us since the beginning of our company! In order to continue to provide the highest levels of service, we recently added two team members to our Client Relations department. Tammy Prebel and Pam Steenstry are new client relations specialists, and will be doing both reception work and technician dispatching. In addition, Jill Panasewicz, formerly the Martin Group Contracts Administrator, will be our new client relations manager. In addition to managing Tammy and Pam, she will be in charge of accounts receivables and collections. Tracy Clemins replaces Jill as our new contracts administrator. She will set up client contracts and their billing arrangements. Nolan Shields joins our team as a new operations assistant. Nolan will be working in the supply management (toner/staples) area and providing warehouse assistance. Please join us in welcoming our new team members and congratulating our existing staff on their recent promotions. As always, we look forward to helping our clients be successful by providing the finest office technology products on the market and exemplary service and support. Warm wishes for a safe and happy holiday season!